Be a part of their morning coffee with this clear glass coffee mug! Holding up to 12 oz. 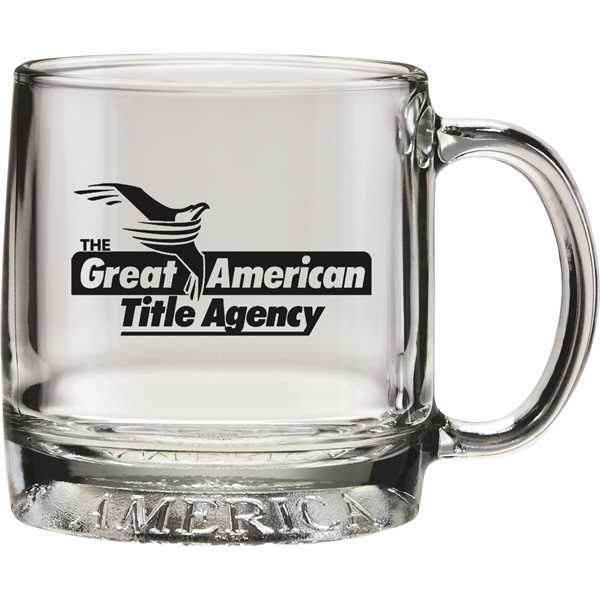 of your favorite brew, this mug features a handle and traditional coffee mug shape. This practical promoter is great for spreading the word about your coffee shop, restaurant, corporate message and more. It even makes an excellent wedding gift and tradeshow giveaway. The American Eagle surrounded by The United States and America is deeply molded into the solid sham bottom producing a striking image. This design is EXCLUSIVE!